Be sure to watch your email closely after submitting your application for interview invites. You should try to reply and schedule your interview as soon as possible to try and avoid schedule conflicts. Some programs offer more interviews than spots available, so if you call back too late you may be waitlisted until a spot opens or even declined! On the other hand, if you find that you can’t make it and already committed call the residency soon to let them know so they can give your spot away. I really liked The Emergency Medicine Resident’s Association’s Interview Guide and highly recommend reading through it just to get thinking about how to start answering interview questions. It’s a good representation of the different types of questions you may be asked at interviews. Some will be more laid back, others more rigorous. Don’t come with the answers to interview questioned rehearsed but do come prepared to answer questions and know what you wrote in your application since these will be many of the topics brought up. Some residencies don’t ask any medical questions in the interview, some will ask you to talk about different medical topics pertinent to your field (e.g. explain GBS prophylaxis and treatment, please read this Fetal Heart Monitor strip), some are personality only; I would know the basic topics for your field of interest before going into the interview season to help you get through interviews like this. Practice convincing others (family, friends, nurses, patients) why you chose the field of medicine you’re applying for, if you struggle to be convincing in front of friends and family it’s going to be really hard to do it during an interview. Bring a list of questions that you may have for the programs you’re interviewing at and keep track of the answers. I’d also write down your overall impression of the program with plus/minus lists at the conclusion of the interview. When you get to the point of ranking the programs it’s really difficult to keep them all straight so don’t loose this information! Definitely go to the meet and greet/tour the night before if there is one, this will help you get to know how the residents interact and give you more chances to ask questions or listen to the answers of questions from other interviewees. Remember that even though this is usually a more relaxed environment, don’t go wild – you’re still, (and always) being interviewed. Don’t go overboard on an open bar and take cues from others as to when it is time to leave. Don’t be a straggler if the dinner is at someone’s house and you are the only interviewee left for the night, this is your cue to go home so the residents can relax too. Same goes for interview days, some residents may tell you they are not interviewing you and you can relax – still be mindful that anything you say or do will easily get back to those in charge of making the decisions on who to rank. This doesnt mean stay quiet all day; it does mean to be professional yet personable. Probably hold back on talk about other residencies you already have a spot at, or if you’re on the fence between one specialty and another, or how bad the food is, or about other students you can’t stand, or even how your chronic pain syndrome is flaring up – These are all stories I’ve heard students tell on interviews, none of which went over well. Be positive for the interview day – residencies are trying to figure out if they will be able to work with and stand your personality for the next 3-5 years and no one wants to work with someone that can’t at least be pleasant on one interview day. Look into the program that you’re interviewing at before you get there so you can tailor your questions to the program and have an idea of why you’re interested in the program. Be professional during your interview. Shake hands firmly and introduce yourself to the interview team. Sitting up straight on the front edge of your chair gives the impression that you are engaged. Don’t yawn. Don’t use unprofessional language such as crap, dumb, etc. 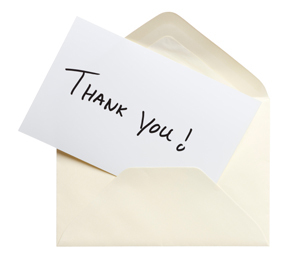 Send a thank you note to the director and anyone else that interviewed you within 2 weeks of the interview.